e-post(유럽문화체험) - 유학의 나라 미국 ? 미국학생들의 독일 유학 !! 유학의 나라 미국 ? 미국학생들의 독일 유학 !! ‘미국은 유학의 나라’라는 말이 최소한 미국 학생들에게는 통하지 않고 있다. 세계 각국에서 미국으로 가는 유학생 숫자는 2003년부터 계속 늘고 있지만 정작 미국 학생들은 치솟는 등록금 때문에 미국을 떠나고 있기 때문이다. 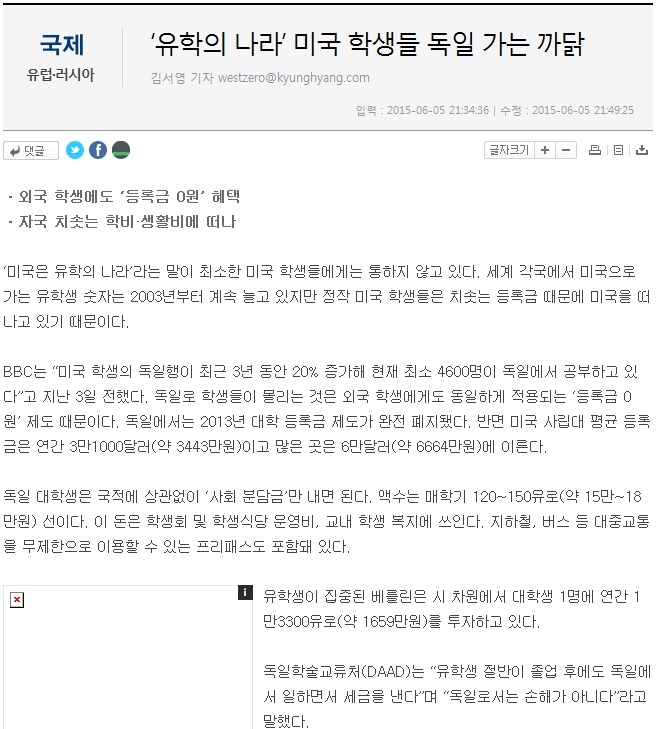 BBC는 “미국 학생의 독일행이 최근 3년 동안 20% 증가해 현재 최소 4600명이 독일에서 공부하고 있다”고 지난 3일 전했다. 독일로 학생들이 몰리는 것은 외국 학생에게도 동일하게 적용되는 ‘등록금 0원’ 제도 때문이다. 독일에서는 2013년 대학 등록금 제도가 완전 폐지됐다. 반면 미국 사립대 평균 등록금은 연간 3만1000달러(약 3443만원)이고 많은 곳은 6만달러(약 6664만원)에 이른다. 독일 대학생은 국적에 상관없이 ‘사회 분담금’만 내면 된다. 액수는 매학기 120~150유로(약 15만~18만원) 선이다. 이 돈은 학생회 및 학생식당 운영비, 교내 학생 복지에 쓰인다. 지하철, 버스 등 대중교통을 무제한으로 이용할 수 있는 프리패스도 포함돼 있다. 유학생이 집중된 베를린은 시 차원에서 대학생 1명에 연간 1만3300유로(약 1659만원)를 투자하고 있다. 독일학술교류처(DAAD)는 “유학생 절반이 졸업 후에도 독일에서 일하면서 세금을 낸다”며 “독일로서는 손해가 아니다”라고 말했다. Research shows that the system is working, says Sebastian Fohrbeck of DAAD, and that 50% of foreign students stay in Germany. "Even if people don't pay tuition fees, if only 40% stay for five years and pay taxes we recover the cost for the tuition and for the study places so that works out well." When Katherine came to Germany in 2012 she spoke two words of German: 'hallo' and 'danke'. She arrived in an East German town which had, since the 1950s, taught the majority of its residents Russian rather than English. "At first I was just doing hand gestures and a lot of people had compassion because they saw that I was trying and that I cared." She did not need German, however, in her Master's programme, which was filled with students from 50 different countries but taught entirely in English. 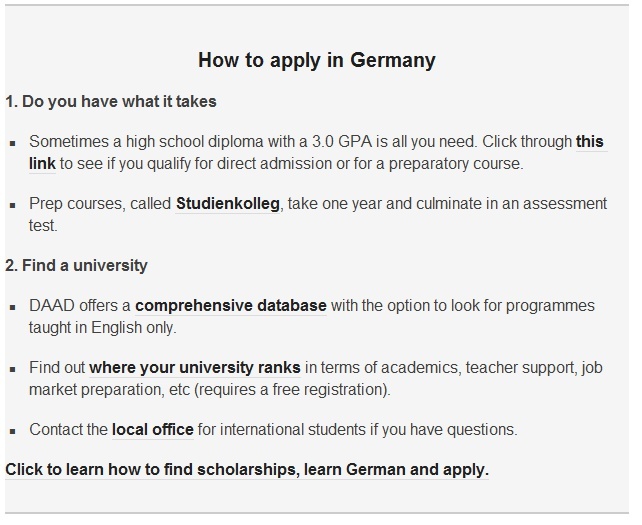 In fact, German universities have drastically increased all-English classes to more than 1,150 programmes across many fields. 독일의 교육제도에 대해서 더 궁금하지 않으신가요? While the cost of college education in the US has reached record highs, Germany has abandoned tuition fees altogether for German and international students alike. An increasing number of Americans are taking advantage and saving tens of thousands of dollars to get their degrees. In a kitchen in rural South Carolina one night, Hunter Bliss told his mother he wanted to apply to university in Germany. Amy Hall chuckled, dismissed it, and told him he could go if he got in. "When he got accepted I burst into tears," says Amy, a single mother. "I was happy but also scared to let him go that far away from home." Across the US parents are preparing for their children to leave the nest this summer, but not many send them 4,800 miles (7,700km) away - or to a continent that no family member has ever set foot in. Yet the appeal of a good education, and one that doesn't cost anything, was hard for Hunter and Amy to ignore. "For him to stay here in the US was going to be very costly," says Amy. "We would have had to get federal loans and student loans because he has a very fit mind and great goals." 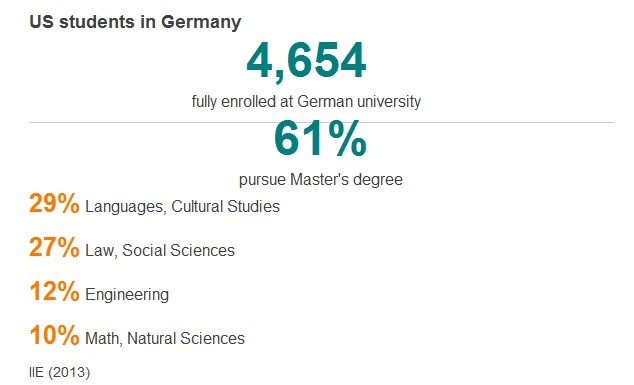 More than 4,600 US students are fully enrolled at Germany universities, an increase of 20% over three years. At the same time, the total student debt in the US has reached $1.3 trillion (£850 billion). Each semester, Hunter pays a fee of €111 ($120) to the Technical University of Munich (TUM), one of the most highly regarded universities in Europe, to get his degree in physics. 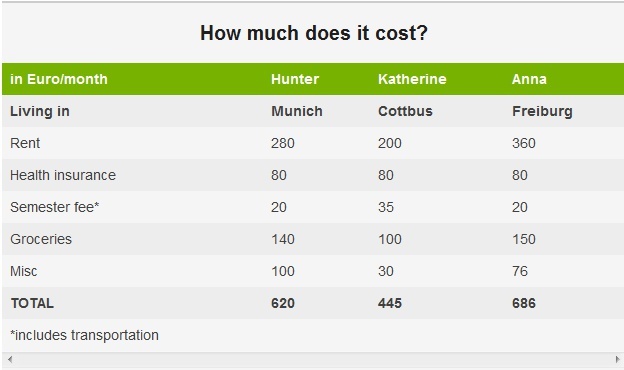 Included in that fee is a public transportation ticket that enables Hunter to travel freely around Munich. Health insurance for students in Germany is €80 ($87) a month, much less than what Amy would have had to pay in the US to add him to her plan. "The healthcare gives her peace of mind," says Hunter. "Saving money of course is fantastic for her because she can actually afford this without any loans." To cover rent, mandatory health insurance and other expenses, Hunter's mother sends him between $6,000-7,000 each year. At his nearest school back home, the University of South Carolina, that amount would not have covered the tuition fees. Even with scholarships, that would have totalled about $10,000 a year. Housing, books and living expenses would make that number much higher. The simple maths made Hunter's job of convincing his mother easy. "You have to pay for my college, mom - do you want to pay this much or this much?"